We enjoyed the long weekend!! Chuck got the entire weekend off work, which is rare … and we also had great weather here in the Bay Area so we got out and about as much as possible. Saturday morning we had a year 2 photo-shoot scheduled for Malina at a local studio. Mom and Dad jumped in a few photos, but it was mostly about her. She wasn’t enamored by the photographer so I don’t have high hopes, but we shall see how they turn out. Then we took a nice walk down Union St and went out for brunch. Malina was incredibly patient and enjoyed 2 pancakes … which is a favorite right now. We spent the afternoon organizing baby boy’s clothes and Malina decided which drawers each item belonged in. On Sunday we took a great hike up past Fairfax! It was far steeper than I expected but Chuck carried everything and I survived. 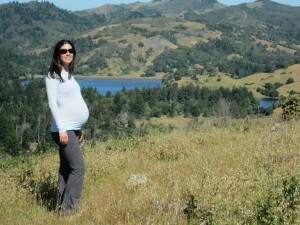 Malina really enjoyed riding in the pack again, so we decided to take another hike in Larkspur on Monday. We also headed south for a baby friend’s first birthday party in Foster City. Malina was the “big kid” at this party. All in all, a great weekend! View photos of the long weekend.